Dr. D. Sarvaiya and his team lent their precious time for Eye check-up on 4th August 2010, children of Sr.Kg. enjoyed identifying the letters on the computer screen. They were also issued the certificates for the same. A Dental check-up was organized for Sr.Kg on 25th August 2010. Dr. Viral Shah examined children’s teeth and issued certificates suggesting treatment if required. 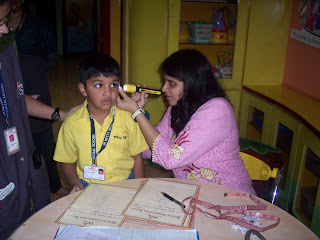 A Medical check-up for little Wittians (Sr.Kg) was held on 30th August 2010. Dr. Pinky Shah examined the kids and gave valuable suggestions. We express our sincere thanks to all the doctors for spending their precious time with our little ones.